On the corner of Carson and 7th streets in downtown Las Vegas, tucked below the Park Avenue Apartments’ faded teal sign, is a small restaurant under a black awning. From a distance, if you noticed it at all, it could be the restaurant of an outdated motel, just another anonymous greasy spoon. But inside the eatery, Las Vegas business owners, entrepreneurs, and tourists sit around clean white tables in red Emeco chairs. The space is brightly lit with bulbs bared in birdcage chandeliers. Indoor plants spill out of planters fashioned from found wood planks. On the menu are truffled egg sandwiches with wild mushrooms and the house specialty, huevos motulenos, two eggs topped with Mexican chili and sautéed bananas on corn tortillas. This is Eat, one of Sin City’s newest and most notable restaurants. It is also the first venture of the Downtown Project, an amorphous group of investors and urban thinkers created—and largely funded—by Zappos CEO Tony Hsieh. By backing Eat, the group, which has allotted $350 million to revitalize downtown Las Vegas, showed locals—and all those watching—that the planned developments were not a millionaire’s land grab but a tangible commitment to the community and authentic place-making. Zach Ware, one of Hsieh’s partners in the Downtown Project and the founder of a startup looking to integrate bike- and car-sharing with cab service, says part of what makes the Downtown Project’s redevelopment strategy unique is that it is focused on finding the right people, not necessarily the right product. Natalie Young, the celebrated chef behind Eat, was one of those people. When she met Hsieh, she had plans to open a restaurant in Santa Fe, New Mexico. Recognizing what she could contribute to the city, Hsieh convinced her to stay. The Downtown Project operates kind of like a community development incubator, investing in community-building ventures the way an accelerator invests in new technologies. Not coincidentally, startups—whether restaurants like Young’s or companies like Ware’s—are key. The organization, registered as an LLC, counts 90 companies in its portfolio, ranging from education to media to mobility. Ware says that despite investing $50 million in technology startups, the group is not interested in making Las Vegas the next Silicon Valley. Instead, Hsieh is betting on a collaborative approach, attempting to manifest his “three C’s”—collisions, co-learning, and connectedness—in the larger community. 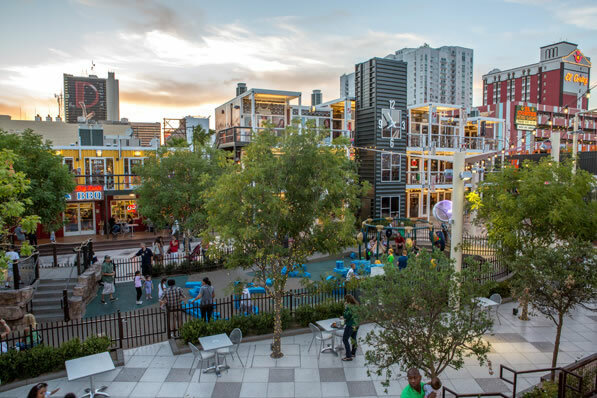 The Las Vegas Container Park is the Downtown Project’s most visible success and is representative of the type of sustainable development that interests the Downtown Project. Constructed from shipping containers and steel-framed modular cubes, the entertainment and retail hub opened last October and has welcomed more than 500,000 visitors since. Stacked to create multiple levels, the containers surround a central courtyard and house fashion boutiques, design studios, and taquerias. Should the Container Park ever reach the end of its lifespan, nearly every element can be dismantled and reused in another form. From a distance, Las Vegas is a caricature—a town that only Matt Groening of the Simpsons could cook up. But Vegas seems to be making a stunning move towards urbanity and sustainability. A funky, all-in urban experiment in design and innovation, underwritten by tech entrepreneurs tilting the way the city sees itself? Wow. Let’s hope what happens in Vegas doesn’t stay in Vegas. Adaptive reuse such as this is essential to the Downtown Project’s plans. “You really want to give respect to the history of a place,” Ware says. Downtown’s numerous vacant or underused hotels are therefore prime real estate. Although the Zappos headquarters’ reuse of the 300,000-square-foot Las Vegas City Hall building is the most obvious example, the Downtown Project is currently involved with a number of adaptive reuse projects to save building materials while preserving architectural and historical details. Most recently, a commercial hub with restaurants and small businesses opened inside the John E. Carson Building, a 65-room hotel built in the 1950s that had been converted to apartments. When Ware first visited Las Vegas in 2008, just before the housing crisis brought the economy to its knees, he saw something that stuck with him. “[There] were two planes in the air, writing in the sky ‘conserve water’ or something like that,” he says. Despite not working directly on issues of sustainability at the time, Ware remembers realizing in that moment that Las Vegas was a real place with real people and real environmental problems. The stunt had been commissioned by the Southern Nevada Water Authority (SNWA), a nonprofit, nongovernmental agency founded in 1991 to address the region’s water issues. Las Vegans tend to be frank about the fact that their city is running out of water, perhaps because the world often reminds them. On July 10, 2014, USA Today reported that Lake Mead, the reservoir created by the Hoover Dam and Las Vegas’s main water supply, had reached an all-time low. Although one might imagine that the Las Vegas Strip, with its mega-casinos and multistory fountains, is the city’s main water hog, the hotel industry uses less than three percent of the city’s water supply, thanks to increased building efficiency and internal reuse policies. Given that the same industry generates 70 percent of the area’s jobs, “that’s a pretty good trade-off,” Perrigo says. The real culprits are homeowners. So, for the past 15 years, the SNWA has been paying them $1.50 per square foot to tear out their turf grass and replace it with drought-tolerant desert xeriscaping. It’s done the same for golf courses. To date, 160 million square feet—more than 3,700 acres—of lawn has been removed, never to be watered again, saving 9 billion gallons annually. Despite the apparent excess, the hotels and casinos along the Las Vegas Strip uses less than three percent of the city’s water supply, thanks to increased building efficiency and internal reuse policies. 1. Avoid Demolition Adaptive reuse, as exemplified in Zappos’s reuse of the old City Hall building and many of the Downtown Project’s new ventures, keeps new building materials from being used and old materials out of the landfill, resulting in a reduced carbon footprint. 2. Invest Early By paying homeowners to replace their lawn with drought-tolerant landscaping and decorative rock, Las Vegas has eliminated 160 million square feet of turf grass, reducing water demand by nine billion gallons annually. Spending money now avoids enormous financial and environmental costs later. 4. Support Transit With the addition of new bike lanes and ten new bus routes in 2010, Vegas sent a message that it was intent on making Vegas less reliant on cars. With SHIFT set to launch any day, Vegas may soon be the epicenter of even greater transit innovation. 5. Work Together Public-private partnerships such as Green Chips, a nonprofit catalyst organization that brings together mayors, executives, and others, can eliminate repetition within sustainability efforts at the city level and foster collaboration between different sectors. The “cash for grass” program is just one initiative. The city also has become more efficient at capturing its wastewater and returning it, clean, to Lake Mead and the Colorado River. “Las Vegas sits on a major water source, the Colorado River, unlike most of the Southwest, which ships its water hundreds of miles from the Rockies or the Sierras,” Perrigo says. According to the city, 90 percent of the water that goes into drains is treated and returned to the river. “No other city in the country can say they reclaim that much water,” he says. It was one day too late to be an April Fool’s joke. On April 2, 2013, tech blogs lit up with news that Tony Hsieh had purchased 100 cars from Tesla Motors for a new venture. The startup, originally known as Project 100 but recently rebranded as SHIFT, is Ware’s primary enterprise. In addition to serving as a partner at the Vegas Tech Fund, Ware is the founder and CEO of the nascent mobility company and runs a team of about 20 engineers, designers, and operations personnel. And the fleet of Teslas—the cheapest iteration of which, the Model S, starts at $70,000—is just one part of Ware’s plan to revamp transit in Las Vegas and, with any luck, around the world. SHIFT, which bought 100 Teslas in 2013, hopes to reinvent urban transportation in Las Vegas and around the world. By rolling everything into a monthly membership, SHIFT aims to break down the barriers associated with various forms of transit like cost, distance, or inconvenience, and inspire more frequent movement throughout Las Vegas, in turn creating more of Hsieh’s coveted “collisions.” Not every car you borrow will be a Tesla; Ware says these are reserved for trips of a certain distance, such as a weekend trip out of town. The Tesla Model S is currently the only electric car that can handle that sort of range. For daily excursions, SHIFT users can still drive electric cars, but more likely medium-range, two- and four-door models. The benefits to both users and the environment are obvious; an increase in the use of bicycles and electric cars will reduce greenhouse gas emissions. But a bigger impact might come in the ways that cities develop when transportation becomes less of a barrier. When a city’s core is inaccessible, due to traffic or otherwise, a vast amount of real estate becomes unavailable to buyers who want to spend time downtown. If increasing access through transit can reduce that barrier, new neighborhoods could be opened up and, according to Ware, downtown areas could become more affordable. Although the average visitor may never know it, Sin City has renounced much of its past environmental wrongdoing and has become an environmental leader in its region. It will continue to struggle to reconcile finite resources with its rapid growth—the city expects 400,000 new residents within the next 10 years—but the city is attracting all the right kinds of attention. It is entering an era when what happens in Vegas is broadcast around the world.